To visualize how things operate, humans use models and build into their models their worldviews every bit as much as the worldview is built into the model, assuming the subject of the model is sufficiently large. Models of the universe are sufficiently large subjects. We can sometimes diagram models to see which we think is correct. You might be surprised how easy this can be and what you really think. Of course, there are also very complicated models, many models are completely mathematic, but even there the presuppositions are built into the model, but we will not go there. This model we are about to create will be off just a little because the shape is incorrect, that is it will be round and the universe is not round. The model Ptolemy (Greco-Roman) developed, a geocentric universe with concentric spherical globes surrounding for space explained some of what we saw, but it was a naturalistic view passed down from his studies of Aristotle. This naturalistic Greek model developed more fully by Ptolemy, a Roman citizen of Egypt carried enormous weight in the Roman period, and, it should not be surprising that it worked its way into the Roman Church as it was the scientific naturalism of the day. This naturalism evolved from Aristotelian naturalism. It is this naturalistic theory the Catholic Church embarrassed and then was burned on with Galileo, not a Biblical Model and this permanently effects the church and its philosophers to this day. Keep in mind this is not a model where we are some egotistical center, as we use the term now (“he thinks he is the center of the universe”) rather the idea is it is the bottom, the pit, or armpit of the universe, the gravitational center where things fall into, the dregs of the universe, not a privileged position. This Greco-Roman cosmos would be called isotropic from Greek iso, or equal, and tropos, meaning direction, so, ‘the same in all directions’ i.e. a sphere, actually a series of concentric unchanging spheres was the original idea. When Rome decided it wanted to be all things Christian, it syncretized the Christian beliefs with the Greco-Roman belief system, largely Neoplatonic, and brought with it the false Greek universe model the Speculative Philosophers guessed was the right one. This has nothing to do with Christianity, that is, until the official Church of the Roman Empire was formed and syncretized itself to the extant Greco-Roman background of Rome itself. The establishment of Rome did not want to give up its educational background or belief system, it merely incorporated Christianity and made it fit comfortably within the establishment. This is indeed critical of that process, it is the wrong way to look at Christianity, but I will also say the core beliefs of that church are Christian. However, many secondary beliefs are false, and Greek, and carried through the reformation into the extreme majority of churches today. Along comes Galileo a few hundred years later and questions that view (he observed a supernova, i.e. an imperfection in the heavens, strictly against the Greek isotropic model) and Catholicism takes an embarrassing hit only because it departing from the actual Biblical teaching because they had not only accepted this naturalism as doctrine, but wrapped other Greek thinking into the church as well, around that idea of Greek perfection or Platonic ideal forms. Their response though caused science to slow it progress for hundreds of years by preventing any scientific results which were contrary to scripture. But this was not the actual case, they prevented any results which contradicted the worldview of the Roman Church which was and remains today an admixture of Greco-Roman teachings and Christian doctrine. Before you evangelicals feel smug about the hit just delivered to the Pope, these survived the Reformation and most are found in churches of all denominations today. The problem came in any hypothesis which promoted a false philosophy (falsa in philosophia), that is one contrary to the church (but this is a mixed bag of thinking) and also one which was false relating to facts (erronea in fide). Now we have a compound problem since Greek speculative philosophy did not well match the real world (save Aristotle’s logic), and so, science nearly came to a halt in the Roman world. Fortunately in the northern empire where authority was applied less efficiently, research did continue. We see today the same and opposite effect of naturalism denying teleological aspects of the universe and particularly in biology also slowing our understanding of the nature of things. The theory directly from Darwin of vestigial organs is one of those. The theory is completely discredited but just last week I had a medical doctor tell me the tonsils were vestigial. Why, you must ask, is a primary immune organ still be considered to be vestigial? Because Darwinians will not admit when they are wrong just as the church did not admit when it was wrong, this seems also to be a human problem, in this case a problem of worldviews. As opposed to simply returning to the Bible, the Roman Church abandoned to this day the idea that the Bible has anything to say about science. This was a huge mistake. The mirror of that is the refusal to step away from Darwin when he has already been deposed. Darwin needed organ vestiges to show humans were currently evolving since he claimed the current processes were keys to understanding all past processes which he picked up from Charles Lyell. His theory of vestiges has been completely discredited right alone with the vile belief in Social Darwinism. 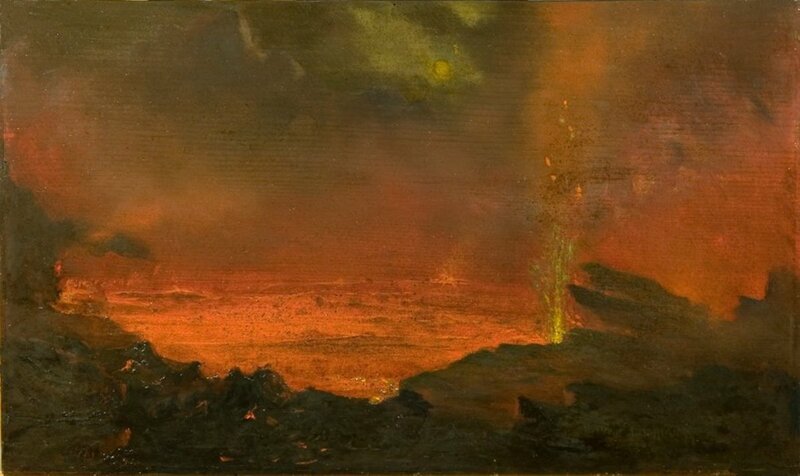 However, Lyell was not the recent originator nor original promoter of such an idea, it was the earlier James Hutton that concluded that current processes were sufficient to explain all the aspects of geology that diluvialists (people who supported Noah’s Flood) believed were remnants of the Flood. So the recent chain was Hutton-Lyell-Darwin promoting uniformitarianism. In my lifetime, from my college time, early 1970’s until now, 2015, the naturalist theories have devolved from uniformitarian to catastrophic recognizing more and more the necessity of periodic catastrophic processes as explanation of geologic features we see. The most interesting fact is that most of these catastrophic events involve hydraulic involvement. The Roman Church accepted the Greco-Roman cosmology of Ptolemy who lived at the end of the first century A.D. and ignored that the Bible stated some eight hundred years before this that the heavens are stretched out, or expanding and like a tent, curtain, or cloth, i.e. it is generally flat and is expanding, and this analogy, my thought experiment below assumes it is more or less round according to how well you draw, but it will suffice to explain what needs explanation. What does the Bible really claim? Remember what a tent looked like in that time. It is a series of cloths pulled over, stretched over and draped around an area to enclose and area, it was a complete living quarters for a family, a potentially sprawling complex on the ground, but also had some height, some place to live in. Using dimensional terms it was long and wide, but not very tall, i.e. it is anisotropic. This description adequately represents the shape of the universe as dimensionally broad in two dimensions but relatively flat, 2800 years ago. The universe is not isotropic (uniform or round), or, stated differently it is anisotropic. Not round? No, not round, that was a Greek naturalistic model developed by the Roman Ptolemy in Egypt after the Aristotelian model who thought the planets and stars were on concentric crystalline spheres centered on the Earth and that each planet, the Sun, and the Moon were on their own sphere, and lastly that the stars were placed on the largest sphere surrounding all of the rest. These were, of course, perfect and unchanging while the world was filled with change and decay. Note here that change is considered bad, not a potentially positive change. All change was in the world and it was always from good to bad, decay and degeneration. The heavens were perfect and unchanging. The Bible informs us of this anisotropic flat broad shape 2800 years ago while most (but not all) cosmogony and cosmology models describe it, as I do below as being reasonably round. This also informs us of just how far away the Greeks were from the truth since they created a model of concentric spheres the center sphere was the world. In other worlds, Greek naturalism created a geocentric model. Since spheres are perfect, nothing perfect can change, and so, the heavens must be unchanging, or so Aristotle thought, Ptolemy saw a problem with the crystalline spheres and the apparent motions he observed. Catholicism actually took an admixture of these thoughts. Remember also recent models have often been round; in fact, one trying to disprove there was a center described it as a balloon where everything in the universe is on the outer membrane and as it inflates, so to speak, everything gets farther apart. A very round model from the 1990’s as I recall. The odd thing is that today’s naturalists are constantly trying, with prejudice, to get away from models perceived as Christian or Biblical but which are actually Greek. The Roman Church held a model that was geocentric with man more or less at the center, so they wanted to disprove there was a center. They did in fact prove the world is not the center per se, the earth moves around in the universe. But so what? The Bible speaks differently than that model they accepted and describes a universe like a tent spread out and also being stretched, i.e. it is relatively flat and expanding. In other words it is anisotropic and being spread out. Sorry Hubble, the Bible beat you by 2700 years! Ah, you have a problem with the Bible telling us the shape of the universe and describing it as being stretched and flat? Would it make you feel better to know that 2800 years after it was written, NASA spent a few billion dollars developing then launching and monitoring the Wilkinson Microwave Anisotropy Probe (WMAP) launched in 2001, ending the main mission in 2010, and they proved that very point, that the universe is relatively flat and but deep and wide within a .05% margin of error in the year 2003? The universe is not round, it is more or less flat, realizing that by “flat” we mean the height is still many thousands of light years thick, the breadth billions of light years long and wide, just like a Bedouin tent! This is a grossly inadequate description to a cosmologist but close enough for our needs. One of the two words used in Isaiah for stretching (Isa 40:22) means basically to throw on, like you would make a tent, or put on a coat, but the word used in Isaiah 45:22 means to change the dimensions, to warp, stretch or deform. Naturalism fails to explain things that people experience. Not only personality itself which is metaphysical, but also such immediate phenomena as near death experiences. A friend had one, and lest you think he just didn’t understand what he experienced, he was a Ph.D. psychologist a Professor at UCSD and other institutions. Like so many others, he did not want to return and was somewhat disappointed when he did. There are numerous cases where people who were completely dead clinically, no heart beat no brains activity for some period ranging from minutes to hours, when they came back returned with accurate verifiable information about things that happened both around them while they were dead, both visual and auditory experiences were reported, (they saw what people were wearing, saw things in other locations, they heard and recalled specific conversations, sometimes embarrassing conversations about themselves, or situations) as well as things remote to them, and sometimes in rooms they had physically never entered, and this information is verified by outside sources. Naturalism fails to adequately explain almost everything. Draw out a three line Cartesian coordinate on a piece of paper where each line is at ninety degrees to the others. Let this represent the physical universe. 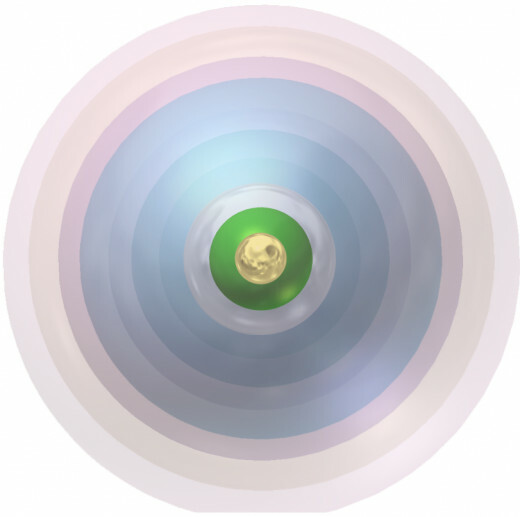 Now, mentally, since this is a digital article, draw a circle representing the universe. You can do this on your screen, or draw this out on paper. Are the lines of the Cartesian coordinates inside or outside of the dimensional lines of the universe model you mentally drew? 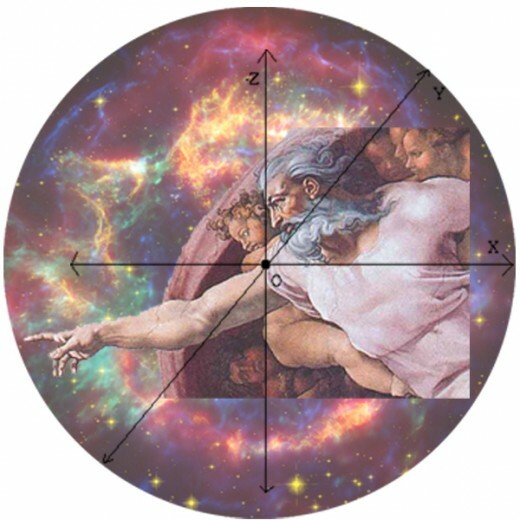 If the lines of the universe fully incorporate the lines of the Cartesian coordinate you drew, that is the circle is the largest part, then you have drawn the unbounded universe model (also called the infinite universe model) where the dimensions are fully contained inside the universe. If so, go back and make this precise, that is, draw each line to the edge of the circle, but not beyond to make this accurate (assuming the universe were some rounded shape). If you simply made a circle on the screen, adjust it a bit. 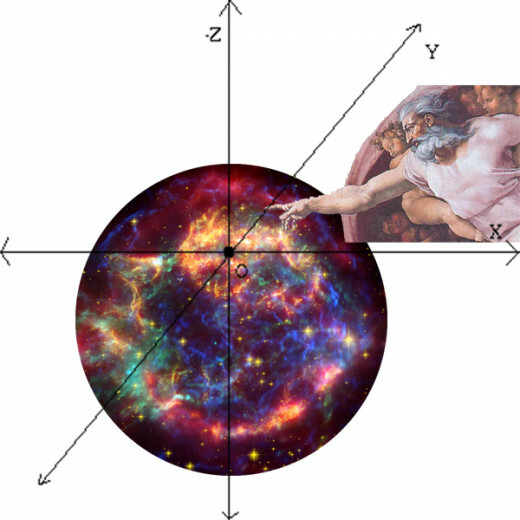 If, on the other hand, you drew this circle representing the boundary of the universe inside the lines, then you have drawn the bounded universe model (also called the finite universe model because there is an end). Again, if you made a small error and a circle line went over the top of one of the Cartesian coordinates representing a dimension, then draw it correctly by extending those lines beyond it. Do you understand the difference in these two models? The one that fully incorporates the dimensional lines believes there is no place beyond the edge of the universe, that even time does not exist there. My question to them is, if the universe is expanding where is it expanding to since there is no place, no location to expand to, and no time for the change of position needed to expand, at least, no time beyond the edge of the universe? There is no place for it to go. Einstein said that the universe constantly creates new space. Understand this implication clearly: Einstein made the universe the creator. Since he held the constant state universe model, repudiated by all now, this wasn’t an issue, it had always existed so it was there to create more. But, if you believe as many scientists do now that there was a time when there was no universe, this idea makes an irrational claim because first there was nothing and nothing created everything. Think of the idea that the universe is expanding into nothing this way: A glass maker is making a bottle using a mold. He gathers his molted glass on his “punty” the stick with the hole through which he blows the glass, he “marvers” the glass by rolling it on a metal surface, then sticks it inside of a bottle mold and blows until the glass has no place else to expand into. What happens when he blows harder? Nothing at all. Why? Because the glass has no place to expand into. Yes, I understand they believe it to be expanding anyway, and that is the logical point, where is it expanding to? The answer is, it is expanding nowhere. 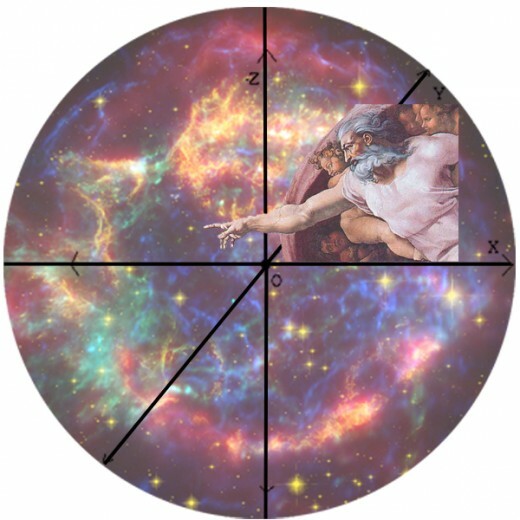 Naturalistic models continually seek to explain how everything could come from nothing at all, called a zero-energy universe, which denies there is any real energy, accepts that something can come from nothing as long as there is a corresponding negative energy to balance everything out to zero, while desperately deny that there is a God who could have caused something to come from nothing. They are attempting to explain away causality. They are approaching a Hindu model where everything we experience is only a dream state and not real at all. This is scientific mysticism, it is here, but not really. Understand that in that particular model a thermonuclear bomb is part of a zero energy universe. It isn’t really a huge release of energy because all of that energy is offset by some gravitational force or other energy (according to which model you happen to hold at the time) and so, is not really energy per se. Remember the name of the model is a zero energy universe, ergo, there is no real energy. This is all part of the song-and-dance the naturalists do to explain away the philosophical failings of the theory. In the unbounded model, the universe confines those dimensions that cause location and there is no place for it to expand into because there is no location outside of the edge of the universe. Take the same glass maker, with the same glass but now, he blows a bottle and simply stops to shape it. He puts it back into the glass oven to heat it up and he blows again, the glass expands because he does have a place to expand to. Yes, one is irrational naturalism; again, the other is rational and Biblical. One claims no boundaries exist for the universe because dimensions do not exist past the universe, so the universe is all that exists and that defines “everywhere.” That is the unbounded model, there are no bounds, or ends. The other model, the bounded model claims that dimensions exist independently on the universe; the universe is confined in them and therefore has a boundary. Once more, the round or spherical shape is for illustration only. Actually to make it closer to reality, remove one dimension then imagine it is simply think in that same dimension and your drawing will be more accurate. Remember Ptolemy used Aristotelian naturalism to develop his defunct model, so, before you go around criticizing the Bible and accepting the views of modern science without question (this is called the expert fallacy in logic), remember just how frequently they change models, sometimes in just weeks, and that they have never ever disproved the Biblical model, they just keep confirming it just like the WMAP satellite did in 2003 2800 years after Isaiah told us the shape of the universe. Funny, that was a similar response when in this twenty first century we found dark matter and dark energy, many scientists said the same. My apologies for not remembering who, but I chucked at the scientist who responded in September of 2011 with “It looks like everything is made up of nothing.” He was being humorous of course, but the Bible called it very precisely that the earth is suspended over “nothing” where in both cases “nothing” means dark matter or energy, or, in Lorentzian theory what they called aether. Remember, models of the universe are things humans produce and every human has preconceptions about how things really are and builds those into his model. They are a framework, not scientifically proven. 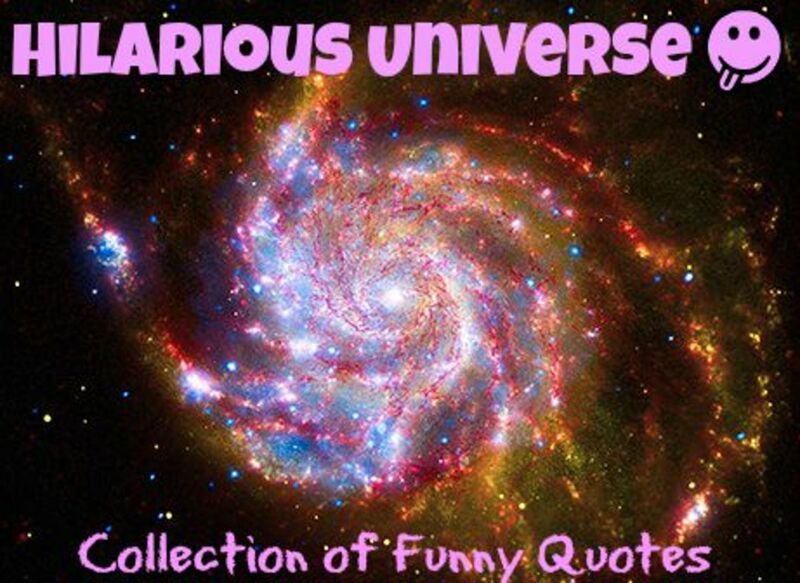 The unbounded universe model is an irrational human model. 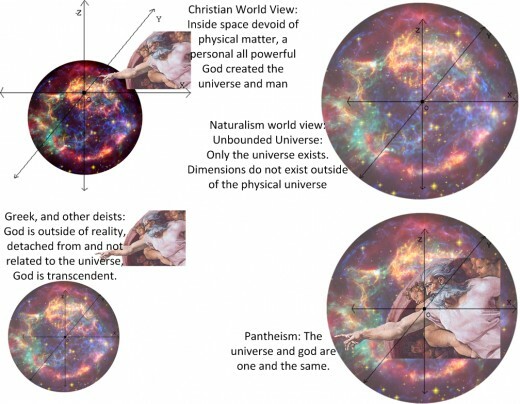 The bounded universe model is also a human model, which happens to both be rational and to align itself with the Biblical teaching that there is something, someone outside of the universe, a presupposition specifically denied by the unbounded model. The expansion of the universe is likely to be proved more and more since energy flows downhill and there is a tremendous though unusable energy reserve in the ether (or aether), now called dark matter and dark energy. Laughed out of existence by the naturalistic followers of Einstein, as opposed to giving Einstein a black eye for being wrong, they simply reinvented the theory by redefining what this was, aether is now called Dark Matter and Dark Energy (both). Remember, the term “aether” was really a placeholder for something that could not the be defined, and “dark” is used because we can’t detect it. Lorentz was right, and only the name has been changed, it is still a place marker for something poorly defined. But this gave the universe a center, which naturalists have been trying hard and yet failing to explain away. Literally dozens of theories have failed and continue to fail trying to avoid there being any model with a filled universe. 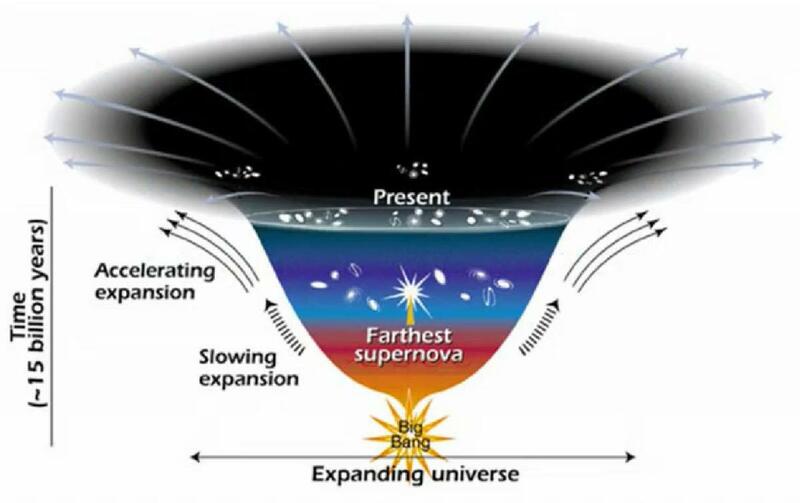 The Nobel Prize was awarded to Perlmutter, Schmidt, and Riess and states “The Nobel Prize in Physics 2011 was divided, one half awarded to Saul Perlmutter, the other half jointly to Brian P. Schmidt and Adam G. Riess for the discovery of the accelerating expansion of the Universe through observations of distant supernovae." The issue they each independently dealt with was whether dark matter and dark energy were forcing the expansion of the universe. It turns out they are. So much for Einstein’s smear on Lorentz. Now you have a problem. Now you have a medium through which light is traveling, and Einstein loses again. Why? Because if light is, as the scientists of old thought, traveling as all other particles do, through some medium and this yields a wave, then if the density of the medium changes, so does the speed of light. So, as the density of the universe changes, which is now generally accepted by science, and there is a medium called dark energy, then the speed of light is not a constant, and, lastly, perhaps it is not the fastest thing there is. In fact, we already know this is the case since the force of gravity is faster than the speed of light, and, recently scientists think they have measured particles traveling faster than the speed of light. How can gravity travel faster than the speed of light? My theory is simple. Large waves travel faster than small waves (in water a wind wave of 0.9ft travels at 9.3ft/sec., and a wave of 48.7ft travels at 48.7ft./sec. (from Wikipedia), and tsunami can travel at 600mph.). Light waves traveling in the medium of Dark Matter as light wavelengths exceptionally small, 420nm is the color green. A gravity wave is made (at least the ones we are capable of measuring) by large things. Large things make large waves, large waves travel very fast. Remember this: Science is always working with and on the currently acceptable model, and that model is not only fallible but changes periodically. Not a single model has accomplished its goal of explaining everything and none that leave out God ever will (apologies to Steven Hawking). Why? Because God actually exists and interacts with the universe and created beings with mind which science cannot, despite all of its claims, explain. Mind is not in this domain, and this domain is the domain of science. So we have a discotomy: One domain being studied by and entity in another domain that denies it exists. 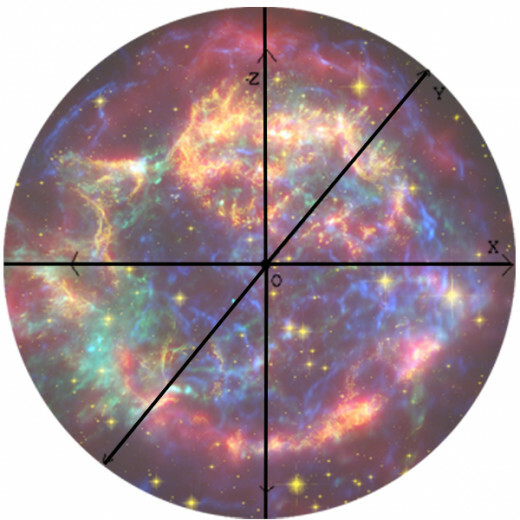 One of the wrong things about modern cosmology is that it views dimensions as being created as the universe expands, and this is a philosophical determination because they believe space-time and mass are all that exist; however, it is also a flawed theory. The question is, if there were no space-time, where would the universe expand into? You cannot move into a house that does not exist, a star cannot move into a place that does not exist either. There would be no place for it. In Latin philosophers say nihil fit ex nihilo, nothing comes from nothing, or ex nihilo nihil fit, from nothing comes nothing. But here naturalism and scientism claims under the pain of idiocy that the universe is, made by nothing and quite literally expanding into nothing. In fact, without the dimension there would be no ability to move because length is needed for a direction to exist. A ray, for example, is a one dimensional direction that travels across the dimension of length, and, you can always add one. Therefore we know that there are dimensions beyond the physical limits of the universe, necessarily true if the universe is expanding. Evolutionary cosmology can be excused for the error, Bible believers, however, knows there are things beyond our physical universe. In fact, I am currently conveying ideas to you that exist in my mind, not my brain. My mind is communicating using physical things (sound, or digital images) to your mind, which again, is not physical. The brain is not the mind, but the mind used the brain to facilitate interaction with other minds currently incarnate in bodies with and by interaction in the physical brain. A friend had a near death experience, very much like many others where he heard and saw things unexplainable by science, and, if you delve into those stories, the eyewitness accounts of those people tell us the brain and mind are not the same things. Let’s return to Newton’s absolutes. He was really describing the dimensions which are unchanged by anything happening inside them. What he called space was actually the distinct dimensions that make up the domain of space, or today, space-time, or the space-time domain. Einstein’s theories relate to gravity fields which exist in the space-time domain, not to the dimensions. Newtonian space and time can be absolute, and Einstein’s relativity still applied to the domain, but, only relatively applied. Take away all mass, every last atom, and what is left? The space-time domain, ergo, the dimensions that make it up and endless time and endless space, the first and most basic of things that exist and in which everything else exists. I would argue what is left is dark energy. They are necessary, not contingent. Newton was correct is measurements of these absolutes and those measurements are relative measurements, that is, they relate to something but without the absolute you cannot have that which is relative because there is nothing to relate to. Remember, before this we were following Greco-Roman theories passed from the same philosophers that gave us perfect space with an imperfect earth and the passage of time was explained as only cycles that occurred in this imperfect world. The heavens were thought to be perfect and perfect meant not only flawless but unchanging, and so time must be relative only to our experiences on earth and not true of the heavens. This produced a naturalistic relativity. But since gods were in the heavens, they too must be perfect and unchanging. This is strongly represented today in Christian churches and is false. Isaac Newton changed that. He was a Christian and saw that there must be some absolute to base things on. So Newtonian space, and I will argue the independent dimensions, are absolute, necessary entities, and, again, where they interact they create domains. In domains you can indeed have entities with relativities of various types but because they are separate and distinct from what houses them, primarily the dimension and secondarily the domain. I can use the time-frequency domain to broadcast a radio wave and I can shape that and point that in a specific direction and, if you are in that direction the wave is traveling away from me and toward you in the time-frequency domain. However, this is a sub-domain of space-time and therefore that wave can be detected, pieces of it “caught” by an antennae, a three dimensional device that shares some of the domains dimensions, and utilized to transmit information. Remember though it is the variance in the wave form that transmits the information, i.e. the frequency dimension itself that is the metric used to determine what the information is. This information is a measured change in either the amplitude (AM=Amplitude Modulation) or the frequency (FM=Frequency Modulation, i.e. length of the wave) that is interpreted as the data and yields voice or music or picture or other data. So we return to metrics being on specified dimensions. Newton saw this as an expression of the creator God who was omnipresent (thus requiring space) and eternal (requiring unending time). He was right on both counts. For God to be present, i.e. a real thing (not a caused, created, or contingent thing) he must be somewhere and that requires the special dimensions. If he is eternal, then he experiences time unending, the very meaning of the word “eternal.” Ergo, every description of God puts him in space and time, but not necessarily in our domain or in our form, that is, until the incarnation. Deny that under the pain of idiocy. Newton saw clearly that quantities generated by metrics relate to sensible bodies, i.e. material things we see and we describe them in relative terms, but we apply ambiguous measurements absolutely. That is, the measure we use may be ambiguous (of length, say, feet or meters, or weight in tonnes (1000 kilograms) or tons (2000 pounds)), we none the less say the measurements (assuming they are performed correctly) are true. So, time, that is, absolute mathematically calculated time, continues to pass without any relativity to any other quantity or quality. This contradicts Einstein’s relativity, but not the actuality of time not being warped rather, the speed of physical items in the space-time domain speeds up in the relative presence of large masses and this can be explained as a gravity wave function caused by the mass acting on Dark Mass. Mathematical space is absolute and immovable regardless of what occupies it. So what do we make of Einstein’s warped space? What is warped nothing? Einstein denied there as aether and therefore he had empty space, but then what was warped? You would only be able to define something as “warped” if it were warped in relation to some idea, standard, or norm. Without this there is no definition of “warped” to describe. Additionally, how can nothing be warped? A “straight” line can actually be a curved line without the absolute definition of what “straight” means. A heavy special body does not warp space itself to create a light “lens” it is the path of the light that is warped as it travels through the medium of what is now called dark matter and dark energy. It is the response to gravity waves in Dark Mass that is altered, not the absolute time or location. Consider small boat traveling in a bay when a large ship passes by, and consider the added motion the small boat goes through as it traverses one direction but the interactions of the waves change its heading. Living in San Diego, a Navy town, and owning a sailboat, this happened many times. It is quite easy to change the course of one object traveling in a medium when another large object has created large waves. Yesterday I looked at some Koi in a pond. I realized that their apparent position was slightly different from what I was seeing because of the effect of sunlight reflecting off the fish in a straight light in one medium and the extra energy in the edge effect of that change in medium as it left the water and traveled through the air to reach my eye. My laser beam pointer could have hit a certain small spot or a fish if I pointed it in the spot it appeared to me because it would undergo that same change, however, an fish archer such as my dad would not hit that same spot if he launched an arrow along exactly the same ray because that edge effect is relative to the physicality of the items traveling through the space-time domain. The light beam hits where the arrow does not. The fish is absolutely in a certain spot at any given instant, and this is not relative to space, but the effect of light is relative, where (assumed here) the straight path of the arrow is not relative and misses the fish because of that difference. An experienced archer fishing will aim below the apparent position of the fish to hit the actual location. This is decidedly not the same thing as Einstein’s warped space, but will suffice for our discussion. Newton recognized in his work that the distinction between the absolute or true quantities and their relative measures is necessary and justified. There are things that are absolute and things that are relative. Space is something distinct from any mass or body and exists independently of the existence of bodies, or you could not apply a measurement (the arbitrary application of mathematics to a quantity) to a segment of the dimensions and domain it exists in. Newton recognized that there is a fact of the matter whether a given body moves and what its true quantity of motion is, and that the true motion of a body does not consist of and cannot be defined in terms of its motion relative to other bodies. So, what was Einstein thinking about with his theories? When he was talking about space-time he was not discussing Newton’s dimensions which were absolute and necessary, rather the domain of space-time. OK, my I.Q. is lower than Einstein, 27 points lower to be specific, but that still puts me in the top 1%. I.Q. doesn't make you correct. Einstein's worldview prejudiced him against the correct view. Remember Einstein’s worldview is atheism as well as naturalism, and so, like Mach before him specifically wanted to show everything was relative, there were no absolutes of any kind. And...wait for it...He believed this absolutely! A little consistency would be nice Al. First he did away with the mass plenum view, that is, the view that there is no such thing as empty space and so he emptied space of the ether of his contemporaries who followed this idea and light suddenly, unlike every other thing that produces a wave traveling through its medium produced a wave without traveling through a medium. He did not impute an answer from similar analogical evidence. This should have been the first clue he was off on the wrong foot. “Wrong foot?” you ask? Yes, his theory missed 95.44% of the mass in the universe, just a small error that prevented his theories from working as accurately as they could have and put modern science back by 100 years. Remember, this was in the 1913-1915 time period, and the WMAP proved he was wrong in 2003, ninety years later but we still to date have not unwrapped the error. Consider that we still have not reincorporated that aether, now called Dark Energy and Dark Matter back into the theories. Until we do we will not understand what we see and in fact we are traveling down the road to more abstract explanations for what we see that are absurd, but like Einstein modern science is making the same error, forbid any explanation outside of the naturalism religion then make up theories without evidence such as multiverse. More in a moment, but let’s pier just a years earlier into “science” and see what how the philosophy of science was forming. 3) everything that can happen is within the realm of science and can be thusly explained. That Philosophy of Science was engrained over one hundred years ago and evolved philosophically (therefore something science cannot test) into Naturalism and Scientism. But these failed miserably at explaining humanity and things we experience. It does not and cannot explain why there are living things at all. In fact that misdirection of science about 160 years ago has led to our significant inability to explain how things really are and why they are the way we experience them. But again, consider the multiverse theory. There is no evidence whatsoever for this, but it too went outside of the boundary set forth above because it postulates something outside of our universe, in fact billions of things outside of our universe. Because of philosophic fall out from this idea we are rapidly trying to prove we are mathematically actually nothing at all (speak for yourself) or that we are only a projection of a figure on the surface of the sphere of space much like a hologram. They had the entire universe figured out, but the idea of the commutation from specified information from DNA into physical structures by living organism had escaped them and would escape understanding until one hundred years after Spencer wrote. The structure was figured out some half century later but understanding everything it does escapes us to this day. The more we learn of DNA the more complex it, and the entire system it uses becomes, and it is very much a chicken-and-egg conundrum. If we are like modern string theorists claim, simply a 3D projection on a 2D surface, then what originated that thought? The projector? This is a problem with Hinduism also. If everything is only a dream, why can we produce theories, had ideas, and create music and paintings? Why is there personality? I watch a movie and see actors on the screen and understand everyone on the screen is an actor, so, when one kills another, I have a moral response and may dislike that person and wish justice would prevail, the writers follow certain moral stories to create the scripts they create, but I fully expect to see the actor again in a different movie playing a different part. I know it is not real, it is Hollywood. If all we are is a projection on a screen, then why do I really want justice for my next door neighbor who was senselessly murdered by a fleeing criminal? How does this differ from the projection of the movie screen? But it is different, and it is absolutely different. So, by denying and avoiding absolutes of any kind, our highly advanced physicists are turning to a very familiar Hindu mysticism that fails to explain anything at all and reduces everything to nothing at all. To the Hindu nature reduced to a dream; to the string theorist it is reduced to a mathematical calculation, in both everything is reduced to nothing. Both are ultimately reductionist philosophies that deny reality. To each I ask, if it isn’t real, than neither are your theories real. If they are not real, why should I pay attention to them? To be more specific to the mathematical scientist, if everything is nothing, then your ideas are also nothing. Very different reductionisms each produced by any specific worldview, but they produce the same result, everything is an meaningless illusion. Are we really to revert to nihilism of Nietzsche after Chesterton walked out of his lecture and discovered true beauty in a Dandelion? Modern science then fails to explain the human experience in that it fails to explain intellectual phenomena everyone experiences (simple thinking, emotions, purpose, goals, ideas, etc. ), it fails to explain phenomena that many have had (near death or death experiences, and other phenomena), and it fails to explain what many people report seeing, finding, and observe things.